On arrival you will be met and transferred to the Ann Hotel for two nights. 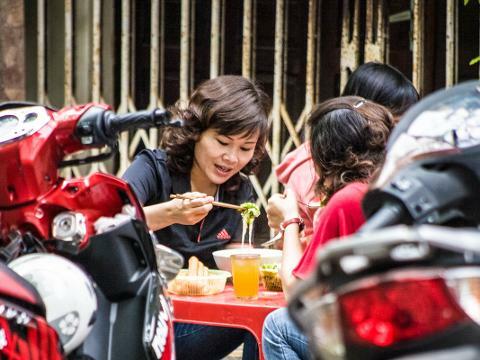 Your culinary journey begins with a visit to the local ‘wet market’ to learn about the fresh Vietnamese produce that is used in everyday cooking. Continue to the home of a ‘true Hanoian’ who learned her culinary skills from her grandmother, a former chef who once served the French elite in the 1930’s. 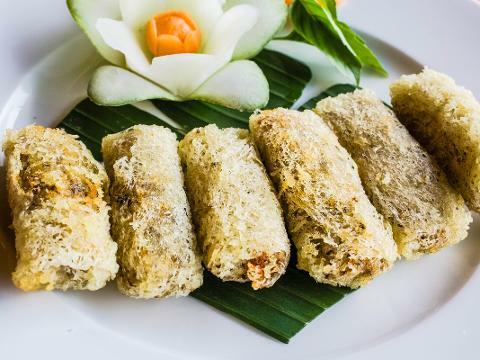 See how to prepare and cook authentic northern Vietnamese cuisine before sitting down to enjoy a delightful meal. In the afternoon, visit Ba Dinh Square to view Ho Chi Minh’s Mausoleum, his wooden cottage and the One Pillar Pagoda, the Buddhist Tran Quoc Pagoda and Quan Thanh Temple. This evening, venture the street food at local market and try some of the local food. Travel to Halong Bay. Board the “Indochina Sails” cruise and relax and unwind as you sail the emerald green waters of the bay. After lunch, take a short trek to a nearby summit for a panoramic view of the bay, then enjoy a swim or sunbathing. Also visit a fishing village and meet the fishing families who have lived in the bay for generations. Join early morning Tai Chi on board, take a short tour to the beautiful limestone grotto before returning to the pier and transfer to the airport in Hanoi. Fly to Danang where you will travel to the charming ancient town of Hoi An. 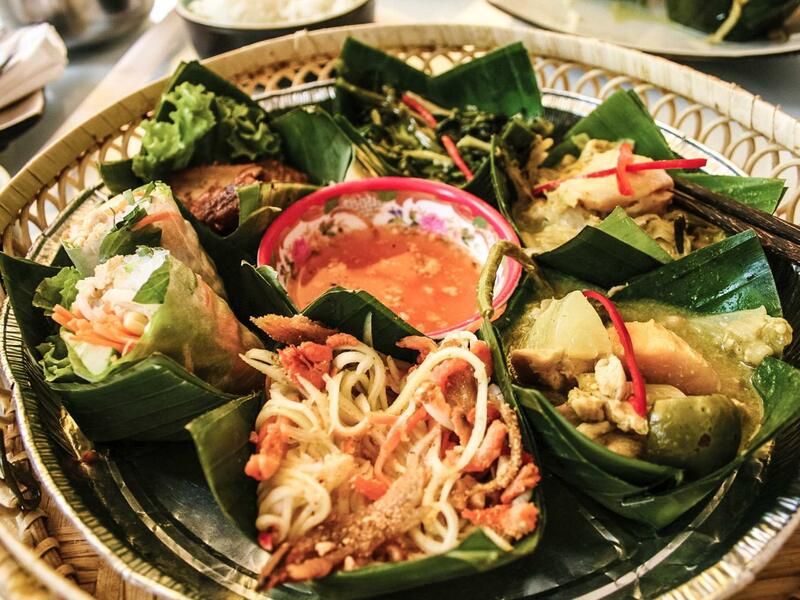 Dine tonight at Mangorooms, one of Hoi An’s best restaurants famous for its original and creative cuisine that has been described as Vietnam-Latin-American-Japanese fusion. In the morning visit a local farming family take a trip around the vegetable garden and join the farmers in preparing the land such as; fertilising, raking, sowling & picking greens. 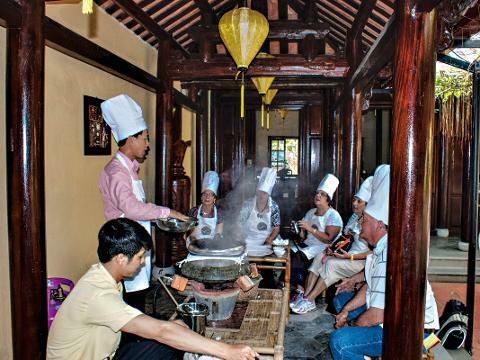 You will also be shown how to prepare the tam huu, a local delicacy you can enjoy at a light local style lunch before the ride back to Hoi An. An afternoon walking tour of the ancient town will take you to the unique Japanese covered bridge, a Chinese communal house and the colourful market. Set off this morning on a walking tour to the colourful ‘wet market’ in search of the freshest ingredients most common in Vietnamese cooking. Join a fun class where you will not only learn step-by-step cooking techniques but also herbal remedies and the tricks of vegetable carving. Your efforts will be rewarded with a delicious lunch cooked by yourself. This afternoon, travel to Hue and stop at the fishing village of Lang Co. Stay two nights at the Alba Spa Hotel. Start the day with a visit to the vibrant Dong Ba Market to see its abundance of fresh produce. Then join a cyclo tour through the ‘Old City’ to Tinh Tam Lake. Travel to the Imperial Citadel, built in the early 19th Century and modelled on the Forbidden City in Beijing and visit the Tomb of Emperor Khai Dinh – the last monument of the Nguyen dynasty. Tonight dinner at Y Thao Garden House, the restaurant set in lovely garden with typical amazing local food. In the morning, transfer to the airport for your flight to Saigon and a three-nights stay at the Grand Hotel. Your afternoon tour will include Cholon (Chinatown), the traditional Medicine Museum, the Reunification Palace, History Museum, Opera House, City Hall, the Central Post Office, Dong Khoi Street and Ben Thanh Market. In the morning visit to a local home where your host will take you to a local suburban market to select ingredients to make a selection of favourite Vietnamese meals. Your host will teach you the secrets and techniques of preparing the dishes which you will enjoy as your lunch today. Return to the hotel where the rest of the day is at leisure. Take a two hour drive to the delta town of Cai Be, where colourful floating markets, emerald rice fields and lush waterways are the highlights of this region. Board a local boat to explore the floating markets and stop at the cottage factory where ‘pop-rice’, rice paper and coconut candies are made. Continue by boat to Dong Hoa Hiep Island and observe the daily lifestyle of the rural people. This evening, enjoy a farewell dinner at Hoa Tuc Restaurant where refined Vietnamese food is served. Farewell Vietnam as you are transferred to the airport for your onward flight.